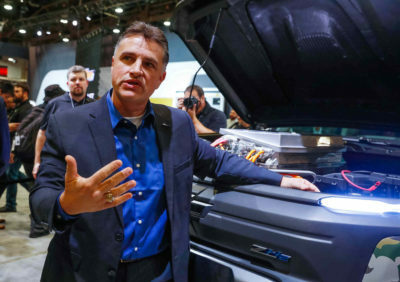 Charles Freese, global head of fuel cell development for General Motors, sat down with TheGreenCarGuy recently to discuss the automaker’s fuel cell technology – and what the future might hold. Freese said that GM has invested more than $2.5 billion in fuel cell research and development in the past 20 years and isn’t slowing down. The company is working on its third-generation fuel cell design, in partnership with Honda – a deal that was announced earlier this year. Costs have come down rapidly and dramatically, he said, to the point that GM is “ready to commercialize” and sees prospects in commercial, military and personal transportation – a “land, sea, air” approach. The success of fuel-cell electric vehicles depends in large part on the availability of the hydrogen they need to make electricity, and Freese said that the auto industry is a decade ahead of the hydrogen industry in terms of technology. He is confident, though, that there is sufficient interest in fuel cells – for stationary energy storage and power generation as well as for propulsion – that the infrastructure necessary to keep fuel-cell vehicles on the road will be available. While declining to offer specifics about what types of fuel-cell vehicles GM could offer first, Freese did hint that we might see a civilian pickup truck that uses some of the technologies – fuel cell and otherwise – being showcased in a Chevy Colorado-based ZH2 fuel-cell military vehicle that’s undergoing testing by the U.S. Army. Charles Freese, GM’s Global Fuel Cell Business director, with the the company’s military ZH2 hydrogen fuel-cell electric vehicle. GM had a prototype fuel-cell vehicle, the Electrovan, on the road in 1966. You ran a public test, Project Driveway, with fuel-cell Chevy Equinox SUVs from 2007 to 2009. Toyota, Honda and Hyundai have fuel-cell passenger vehicles on the market now, but you don’t. Why not? I don’t think they’re getting much revenue out of the vehicles they’re selling right now. If you don’t have the ability to develop these laboratory evaluation processes, as we did, then you have to go to the field, eventually, to get that experience. We made a conscious decision as we came out of Generation Zero hardware, which was the Equinox, to take cost out of the system. We could have put up a low volume production program, but I’d rather divert that money to development as quickly as possible in the lab. The Electrovan showed the promise of fuel cells, but it also showed how much of a challenge there was. It was the first transfer of fuel cell technology out of the space program into the civilian sector but it was a much different system than we have today and wasn’t something that could be commercialized. With our next demonstrator vehicle in 2002 [GM’s Hy-Wire], you had to drive around in one direction, if you changed direction the water the fuel cell stack was making would slosh around and foul things. More than three decades after the Electrovan, we still hadn’t learned how to manage the water. What went on in those years after the Electrovan? Fundamental research, in government labs and corporate research and development departments around the county and around the world. It was development of the proton exchange membrane designs that we have today that we started to say ‘Wow, we can take this thing to the next step.’ The Project Driveway Equinox vehicles were developed when we got the technology to the point that we could say yes, it could meet customer demands. How much has that enabled you to speed things up? Dramatically. It’s at least a four-year program to put a vehicle into production. You freeze your technology and then start showing that you can make thousands and thousands of the vehicle without any variation. By the time any design gets out there it’s at least four years old. We couldn’t afford that. The technology was moving too fast at that point. Lab testing allowed us to do the Gen 1 design make some prototypes, evaluate them in the laboratory and then skip past production and go right to Gen 2. GM did the fuel-cell Equinox program with regular people behind the wheel, now you’ve got a truck for the military. What you don’t have is civilian and military at the same time. Do you now see more promise in military use? We haven’t announced a vehicle program yet, but we have announced that we are building the plant to build the propulsion systems that will be used by vehicles from both Honda and GM. The ZH2 program for the Army is an opportunity to explore this opportunity…it’s not strictly for military. If you deign the right fuel cell system it can be relatively modular. It gives us a system that can be sized for various types of vehicles. If the technology is moving so fast, then by the time you are ready to produce a Generation 2 vehicle won’t you be on Gen 3 fuel cells in the lab? Seems it would prevent you from ever getting a vehicle out to the public. You have to have confidence that you can build the technology into an architecture that won’t require you to replace every single thing [on a fuel-cell electric vehicle] with each update and improvement. If I set up a production plant I’ve got to be able to use some elements of that plant for each subsequent generation. I’m working on Gen 2, that’s the one we’re commercializing tight now, and the one that Honda will use. It’s a 50/50 partnership. I’ve already got a team working on Gen 3. We’re not just machining a bunch of parts out of big blocks of metal, we’re developing all-new manufacturing processes to build these new designs. That’s the way this team is set up. We have manufacturing engineers right alongside development engineers and we’re developing the two things together, the fuel cells and the manufacturing systems.